This giveaway has ended. Thanks to all that entered!! Make-up makes the perfect stocking stuffer and 100% Pure Mineral Eyeshadow is even better! As I was browsing Etsy, I came across an amazing make-up company called Orglamix. They make pure mineral eye shadow, pure mineral foundation, pure mineral blush and pure mineral glow. All Orglamix products are free of parabens, sulfates, synthetic fragrances, synthetic dyes, petro-chemicals and phthalates- and are only pure and safe minerals. Orglamix has 75 color choices and amazing combo sets! 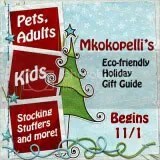 They also sell Eco-friendly make-up brushes, gift certificates, gift sets, monthly kits and more. Orglamix also offers a 100% money back guarantee! That way you can try new colors, new formulas, and new products risk-free. Not to mention they have totally affordable prices! Orglamix is sold by weight, not volume, so you get more product. You can get 1 gram of eye shadow for $3.99! We will be having our holiday pics taken soon, so I’ll be back with some crazy eye pics! Until then, have your own Orglamix experience and check out their awesome website with tons of choices. Be sure to check back weekly for their specials! The Giveaway: Orglamix would like to offer 1 lucky winner a 3 piece collection of their choice! How to Enter: Go to Orglamix and tell me which 3 shades you would pick. Make sure to leave your email address!! I cannot contact the winner without it! New disclaimer: I was sent these items to review for free by Orglamix. This is NO way changes my opinions about the products or company. These are my thoughts, opinions and results. Silk, spark and espresso!!! OMG I want them all!! I would pick the cinammon, cashmere and cloud, thanks! I would choose lilypilly,cafeaulait,silk colors. I like the colors, Iris, Cloud, and willow…to name a few 🙂 Thanks for the giveaway! !